We arrived in Rome around noon on Thursday, found our B & B easily, and settled in.. Rita's main interest in Rome was the Vatican Museum but we felt it was too late in the day to set out for the Vatican, so we decided to visit the section of the city closest to home; the Colosseum, the Arch of Constantine, the Roman Forum, the Piazza del Campidoglio, and the Victor Emanuel II monument. 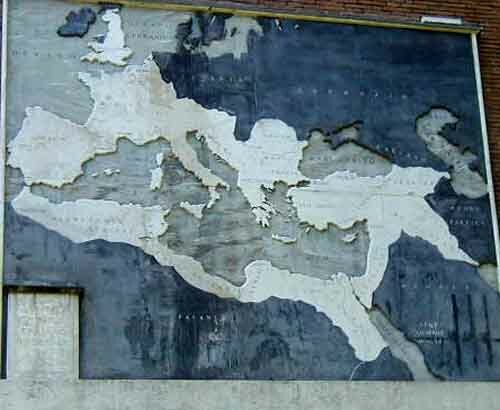 This map shows the extent of the Roman Empire at its peak. The next morning, we walked to the subway on our way to the Vatican, but as soon as we entered the subway station, we were turned away by the police. We eventually learned that a transit strike was underway. We attempted to get one of the last trolleys heading in the right direction, then we tried to get a taxi or a bus (a few were still running for some reason). 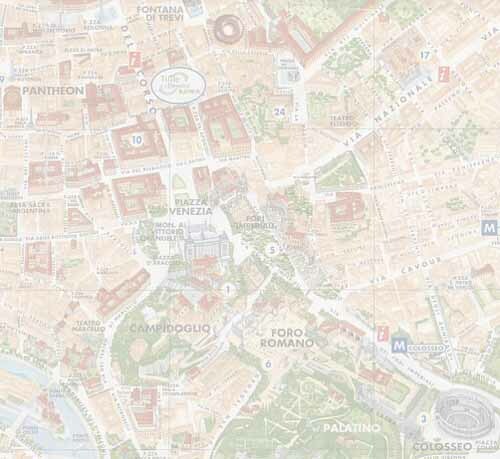 Eventually, we started walking in the direction of the Vatican, visiting interesting places along the way including the Trevi Fountain and the Pantheon. By the time we reached the Vatican museum, it had closed for the day. 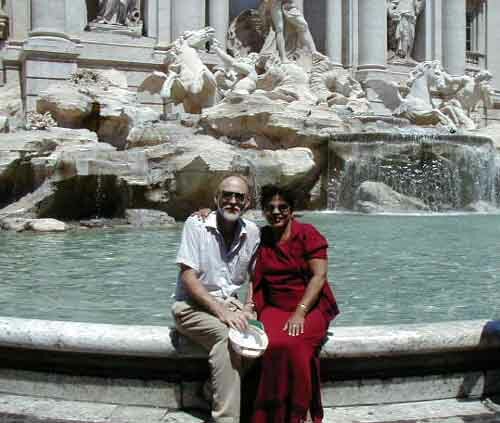 We spent a while in St. Peter's Square, found a great restaurant for supper, and headed back to our B & B where we made arrangements to stay a third night, Saturday night, so that we could spend the day Saturday at the Vatican. 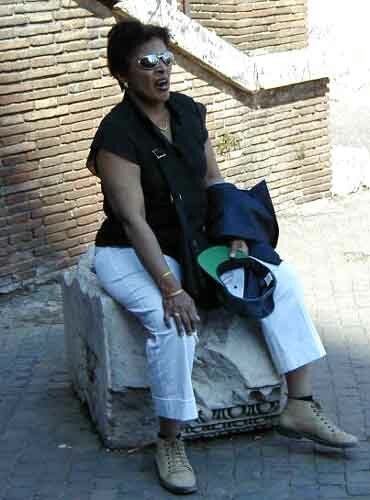 Rita takes a break during a long day of walking around Rome. Saturday morning we reached the Vatican without incident, and joined the long line of tourists moving slowly toward the museum entrance. The Vatican Museum was crowded, especially the section approaching the Cistine Chapel, and time went fast. We were able to spend about 10 minutes in the chapel before closing time. We walked over to St. Peter's Basilica for a visit, and spent some time in St. Peter's Square. 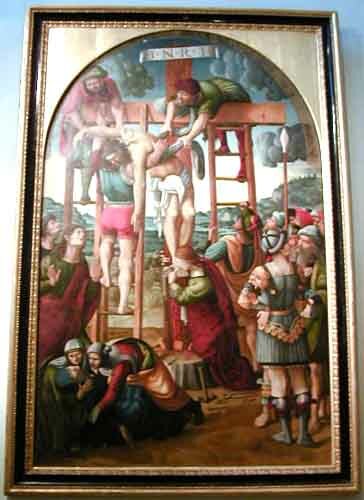 After I took this picture in the Vatican Museum, I was politely told that photograpy was not allowed. On the way back to our B & B we stopped at the train station to buy our tickets to Assisi for the next morning, and learned that the railroad would be on strike the next day. The host at our B & B helped us make arrangements for a taxi to the bus station, and a bus to Assisi, and early Sunday morning we were on our way to Assisi.